PLI STICK PACKING 686 is a clean odourless, pliable packing used to seal stuffing boxes. 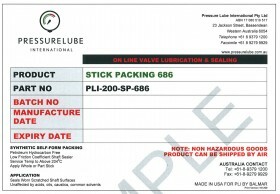 686 is a petroleum hydrocarbon free stick packing made with LIQUILON®*. 686 continues to seal and lubricate long after conventional packing has failed. Regardless of the size of the stuffing box, 686 will form itself to the configuration of the box and shaft and compensates for wear by remoulding itself. 686 can be used as a supplement to worn conventional packing or intervals with conventional packing. 686 services temperatures to 400°F (204°C) and pressures up to 10,000 psi. 686 Packing is unaffected by most acids, oils, caustics, and common solvents.